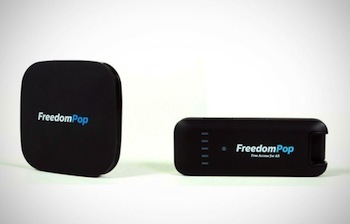 FreedomPop Home Internet brings affordable broadband Internet for the home. Free, low-income and just plain cheap. FreedomPop is a new upstart in both the internet and wireless phone industry, offering very inexpensive — and even free — internet and mobile phone plans. FreedomPop is partner in the Connect2Compete low-income internet program, and those low-income Americans who qualify get a higher level of data usage and a lower price on equipment than the general population. But even without qualifying for that, the plans are still incredibly cheap, and as we said, even free. Both low-income and those not low-income, please continue reading this page and we’ll make sure to outline plans for both. FreedomPop Home Internet is not DSL internet, and it’s not cable internet. Instead, it brings the internet into your home through a wireless signal, which is then distributed to your computers by a wireless router, called the Hub Burst. In plain English, you plug the wireless router into the wall, and any internet-enabled computers within normal WiFi distances will connect wirelessly. The beauty of this type of technology is that you don’t need an installer to come out and set up a cable or DSL connection. You just plug in the router and turn it on. In order to use any of the Hub Burst home internet plans, you’ll need a Hub Burst from the company. That will set you back $89 (only $40 if through Connect2Compete), but it’s a one-time cost and honestly it’s in line with the cost of the average wireless router. All of the plans outlined below work with this router. You can change plans at any time and there is no long-term contract. Free Internet: 1.5 Mbps (megabits per second) free internet is yours, as long as you don’t go over a the one gigbyte (GB) per month allowance. If you are checking email and doing light web surfing, you should be okay with this limit. This free plan works for any customer, a Connect2Compete qualifying one or anyone else. Additional Data: $10 per GB/month. Basic Internet: For just $9.95 per month, you will get up 1.5 Mbps speed with a more generous 5GB of data usage per month. That’s five times the free plan’s limit. This should handle many peoples’ needs, notwithstanding the streaming of too many videos. Additional Data: $7 per GB/month. Faster Internet: If you sign up for this $14.95 plan, you’ll get a big bump on both speed and usage. The download speed is quadrupled to 6 Mbps, and you’re data limit is raised to 10GB. Additional Data: $7 per GB/month. Fastest Internet: The highest priced plan, at $18.99, provides the same 10GB maximum data usage, but it gives you their highest, super-fast speed of 8 Mbps. Additional Data: $7 per GB/month. 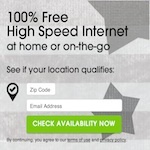 Connect2Compete Internet Plan: Those who live in one of the 14,000 zip codes of the country with median incomes under $35,000, can get a slightly better deal on the “Free Internet” plan described above. While you still will get a 1 GB per month usage allowance, you will be able to purchase the Hub Burst for $40 rather than the normal $89 price. And, when you hit your limit you won’t be automatically charged for more data like would be with the regular plan. Instead, you’ll get a message that you’ve run out and you can choose to buy more GB’s of data or not. What happens if you go over the data usage limit? FreedomPop will charge a top-up amount so you may continue using your FreedomPop service without interruption. The default top-up amount is $10.00. If your usage in any month gets to within 100mb of your monthly plan broadband usage limit (or in which your account balance falls below $2.00) your account will be charged the automatic top up amount. You can turn off the top-up feature if you prefer. If disabled, your account will be suspended for the month when you reach the top-up threshold. Connect2Compete users will receive a message that they are going to run over their data limit, with the option to purchase more. And a regular user automatically is charged for another block of data. Just how do you know if you are using too much data? Easy. Log into your account through FreedomPop.com, your data usage will be displayed by clicking the “Data Usage Detail” tab. You can purchase an add-on for a small fee (currently $1.99) that will alert you via email when you are nearing your plan’s limit. In fact, there are lots of add-ons. Review about each one carefully, because you might not need them. The company understandably tries to sell you some extra features, since they can’t make money just by giving away free and ultra-cheap internet. Don’t feel pressured to buy them. You can earn more data credits by referring friends and family to FreedomPop; you’ll get an extra 50MB for each one that signs up. You also can earn additional data credits by clicking on ads and partner promotions. There’s one catch: Unless you pay for FreedomPop’s rollover plan ($3.99 a month) this earned data, and any other unused data, will disappear at the beginning of your next billing cycle. Serious techies will laugh at the 1 – 12GB data limits on the plans. But readers here at CheapInternet.com aren’t expecting cadillac plans, and aren’t willing to pay $45-60 a month for their internet. Getting a free internet plan that let’s you keep in touch by email, look up information on the web, and read the news, potentially for free and even for $10, is a blessing to many in the low income brackets. 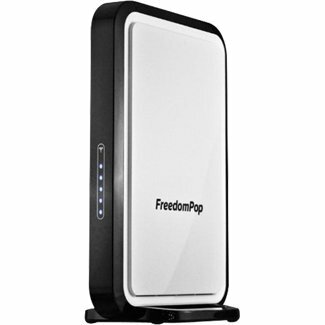 We think the FreedomPop plans are terrific for them. 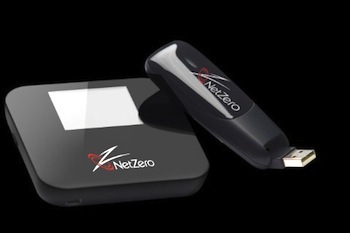 And if you are interested in FreedomPop Home Internet, you might want to also check out competitor NetZero’s DSL plans if the data usage allowances have you troubled. Those plans have no limits. The cost a bit more, but are still way under the usual prices for DSL service. FreedomPop is a sweet service, but check them both out to compare. While you can contact FreedomPop directly to get your Home Internet service set up, you can also connect with them through the Connect2Compete program (which also represents many other internet providers as well). By going through Connect2Compete, you may very well get a better deal for the same plan — if you live in one of the 14,000 zip codes Connect2Compete has determined the median income is under $35,000. It won’t hurt to try them first, just in case. You can order through Connect2Compete if you qualify. You are eligible if you you live in a zip code that Connect2Compete has identified at one of the 14,000 lowest income level zip codes in the U.S. The only way you will know is if you go to their site and put in your zip code. If you have checked Connect2Compete and your zip code qualifies, if you don’t want to continue your order online you can also speak with a sales representative by calling (877) 848-2810 Monday-Friday 9am-5mp PST. 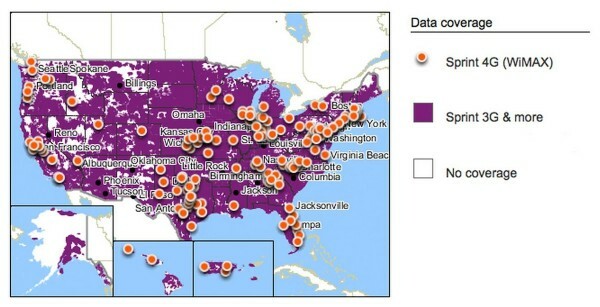 Unfortunately, FreedomPop’s coverage does not extend across the entire United States. It does serve most metropolitan areas, but other than in the Northeast, it can get spotty between cities. You’ll just have to go to their website or call them to see if you can get their service in your area. I live on SSI and it’s very low income. I can’t afford to pay high price for internet. Do yourself a favor and check out ALL the low-income internet plans before you choose one to enroll with. You can find them all here: Click here! We provide a link to the company’s website, Kevin. Check it out. New York wants to boot cable provider Spectrum: What will happen to its low-income internet customers? Sprint giving internet and computers to one million students. Here’s how to participate. But don't miss a thing! We'll send you news as it is published. 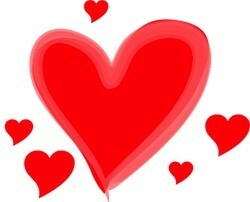 Just CLICK HERE, enter your email address, and then respond to the confirmation email in your inbox. If it's not there, check your spam folder.